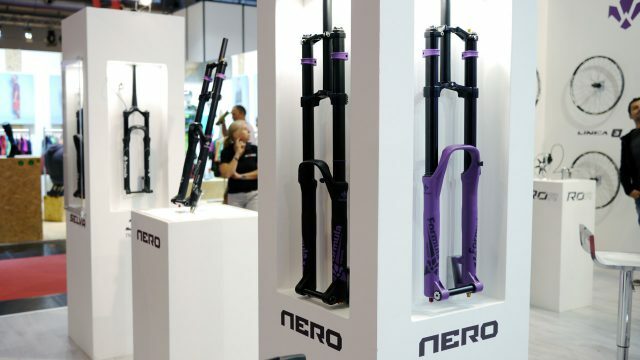 Until now, Formula have only made brakes, wheels and single crown forks, but this year all of that changed with the Nero, their first dual crown downhill fork. 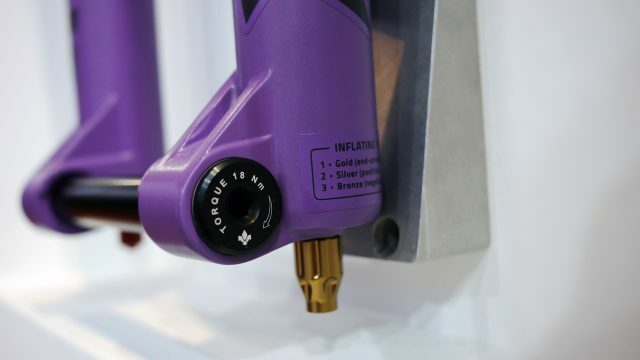 Unlike other manufacturers, they’re offering both air and coil versions of it. 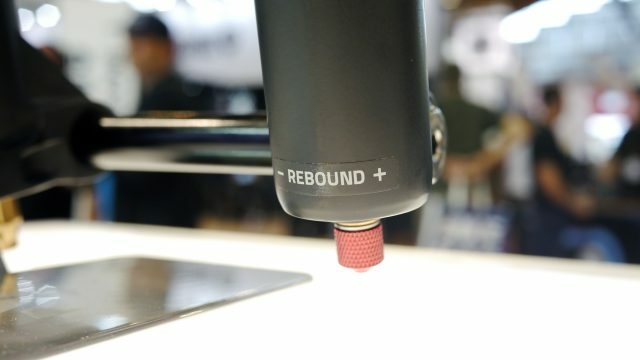 We investigated at their stand during Eurobike 2017. 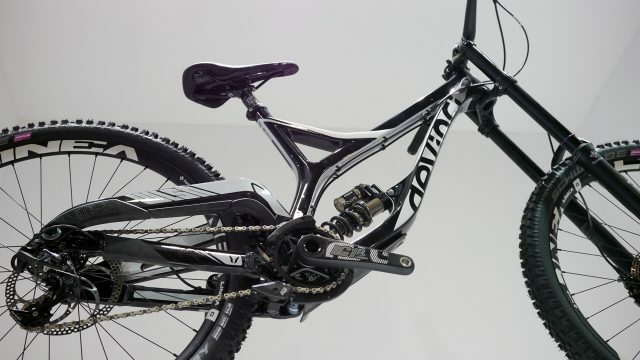 The Nero R is a three chamber air fork for downhill bikes, using Formulas “3Air” system. 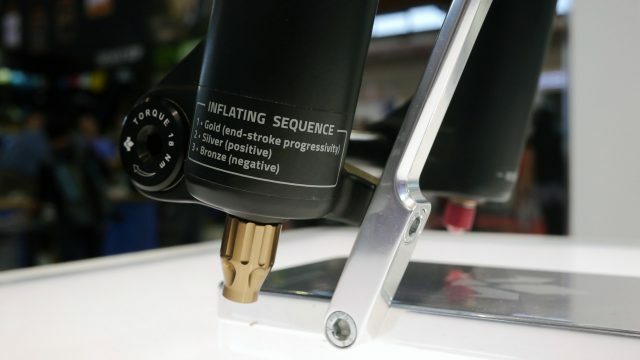 The idea is that, with only a shock pump, you can tune every aspect of the Nero R’s spring curve and make it behave in all kinds of different ways, depending on how and where you’re riding. The top of the left fork leg has valves for the progressivity of the end stroke (gold) and positive air chamber (silver). The bottom of the left leg has this bronze valve for setting up the negative air chamber. It’s important to set the three air chamber pressures in the correct order, or you could end up with a non-functioning fork. 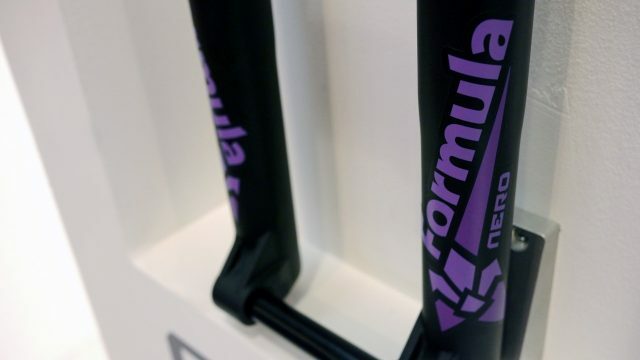 That’s why Formula have made the valves an easily memorable sequence of gold-silver-bronze, as well as printing the sequence on the bottom of the left fork leg. On the back of that leg there’s also a setup chart with PSIs for given rider weights. 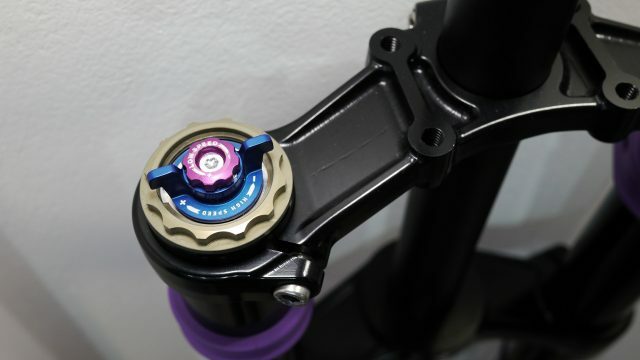 Formula stress these are just a starting point, from which riders can tune the fork according to their preferences. Bottom of the right leg has the rebound adjuster. And the top of the right leg high and low speed compression dials. 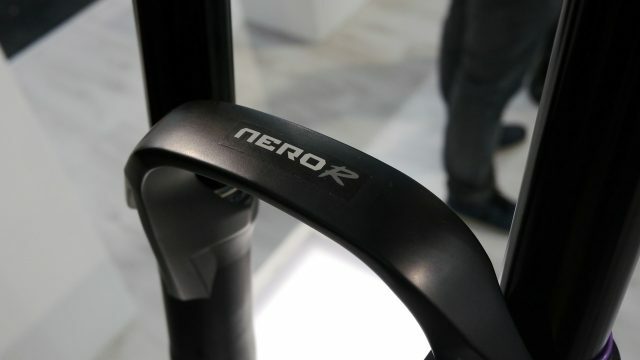 The Nero has 200mm of travel and comes in 27.5″ and 29er versions. 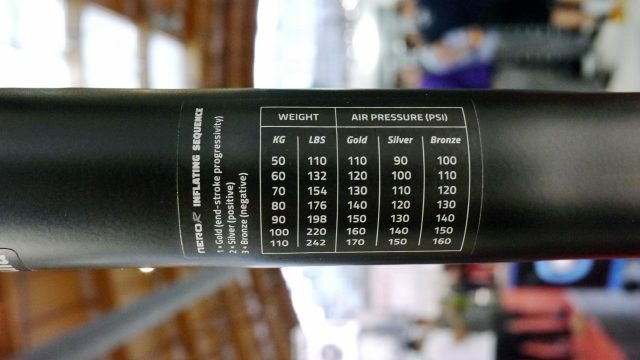 The 29er one can optionally have 180mm or 190mm travel, and claimed weights for the Nero R 27.5 is 2.61Kg, with the 29er version adding just ten grams. 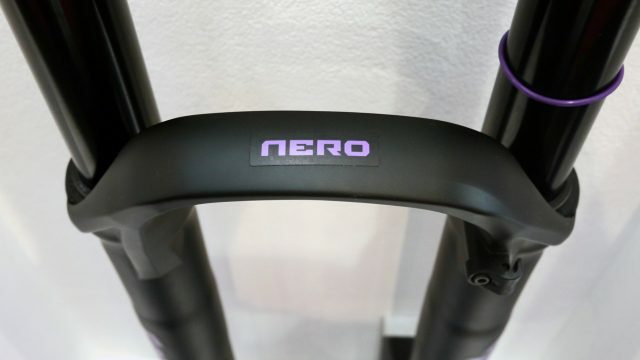 As well as purple with black decals Formula showed the Nero R in their more established black and white colour scheme. 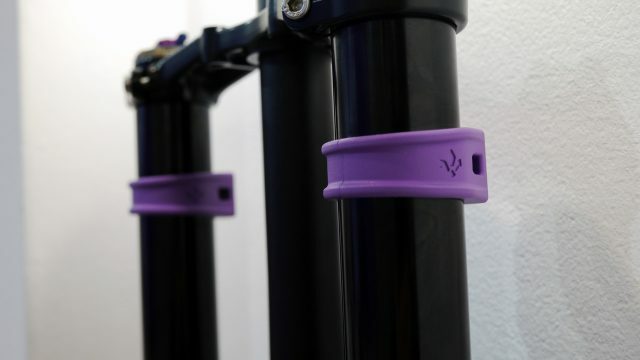 Both had these natty purple bump stops though. 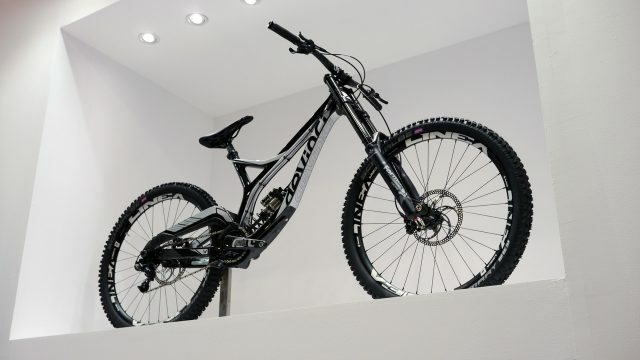 The Nero was being exhibited on this Devinci Wilson Carbon. 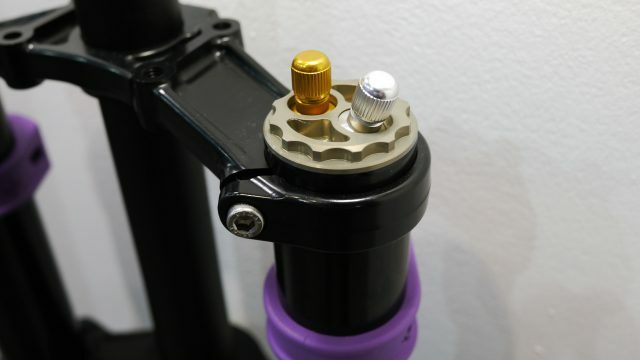 Formula don’t make shocks at the moment, so it was equipped with (fellow Italians) Extreme Racing Shox’ Arma HBC. 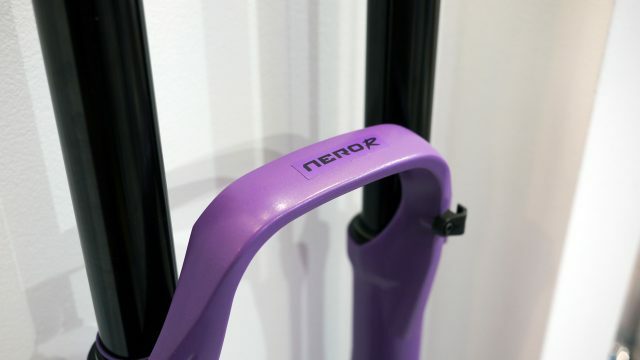 This, in black with purple graphics, is the Nero C coil fork. It has the same damper as the Nero R, but instead of the air valve, a preload dial on top of the left leg. 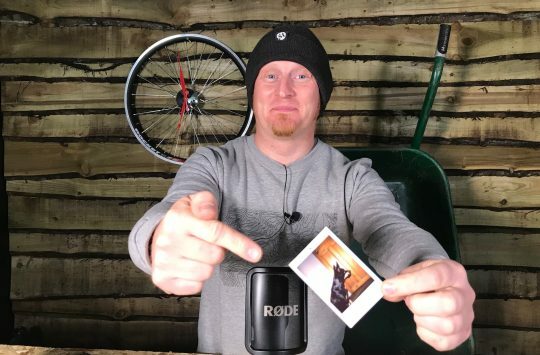 Formula are presenting the coil version as having a slight bias toward bikeparks and freeride than racing, and the Nero R are having a slight bias toward racing over the other two. 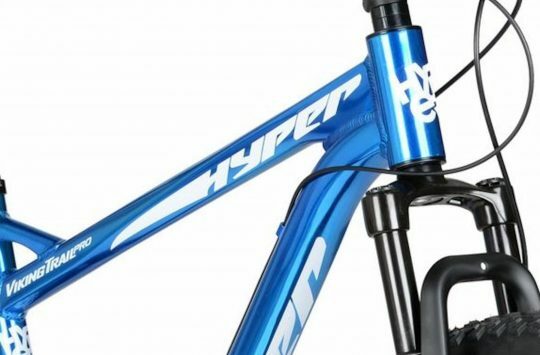 Like the Nero R, the Nero C is available for 27.5″ and 29er wheels, though Formula have given no claimed weight yet. 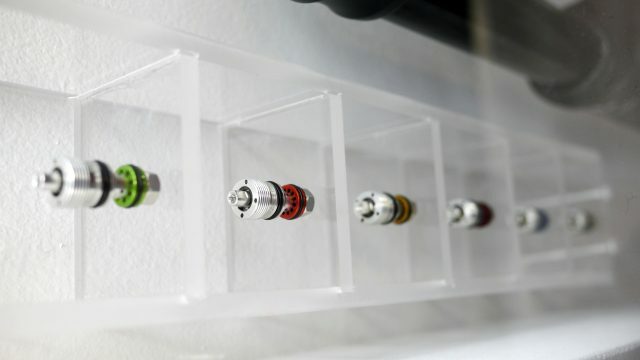 These are Compression Tuning System (CTS) valve heads for Formula’s single crown Selva, 35 and 33 forks. They let you tune the linearity or progressivity of those forks in various ways, and it only takes a few minutes to swap one for another. 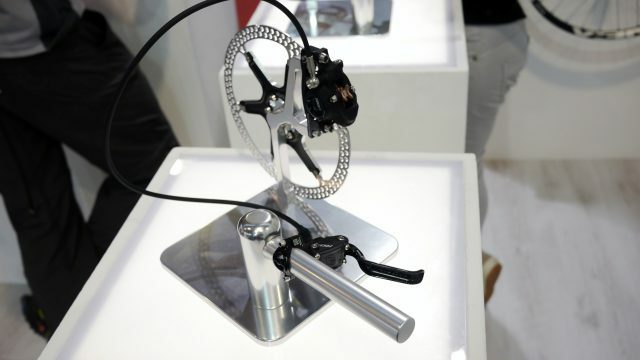 Formula had some of the shiniest brake demo stations at Eurobike. 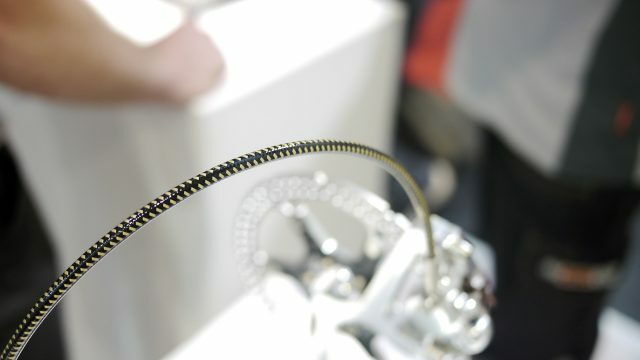 If there were a Eurobike Award for fanciest brake hose. Formular might well have got it.